Here's a photo and story of a baby with two faces was born in a northern Indian village, where she is doing well and is being worshipped as the reincarnation of a Hindu goddess. 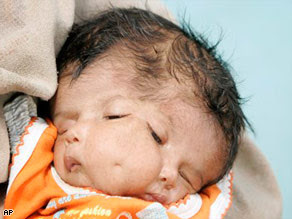 The baby named Lali apparently has an extremely rare condition known as craniofacial duplication, where a single head has two faces. Except for her ears, all of Lali's facial features are duplicated... she has two noses, two pairs of lips and two pairs of eyes. She drinks milk from her two mouths and opens and shuts all the four eyes at one time. "At first I was a little bit afraid," Vinod Kumar Singh, the 24-year-old father of the baby. "But then I accepted whatever God gives. "He said he took his daughter to a hospital in New Delhi where doctors suggested a CT scan to determine whether her internal organs were normal, but Singh said he felt it was unnecessary. IMHO, every baby born in this world is a gift from God and Lali is one of the precious little angels who will soon be walking on Earth. That baby is really interensting, and yes, she really have all the right to live in this world.